Please note the sarcasm in the above headline. NEW YORK (Reuters Life!) – Stress caused by a slowing economy, shrinking retirement accounts and rising unemployment rates is driving some American smokers to increase the habit or delay quitting, according to a new survey. A quarter of smokers who are worried about the economy said fretting over it has driven them to smoke more each day, while another 13 percent said they have delayed quitting. What’s that? Smoking has become cool again? “The turbulent global stock markets have caused virtually every American a certain level of stress. Those who also struggle with an addiction to tobacco products are at an increased disadvantage as they contemplate quitting, or feel the urge to smoke more cigarettes,” Cheryl Healton, the president and CEO of the American Legacy Foundation, said in a statement. NEW YORK (AP) — Consumers worldwide who are watching their spending bought more burgers and chicken breakfast biscuits at McDonald’s in October, leading to a big rise in sales at established locations for the fast-food leader. Now listen, I understand that times are tough. Unemployment is up, there are bills to pay, credit card debt is piling up, and you just don’t know what the heck you’re going to do about it. One thing is certain, though – poisoning yourself with cigarettes and greasy food is not the answer. These things make you feel worse, not better… that’s in the short-term and the long-term. You won’t get sick as often. When you do get sick, it won’t be as bad or as long. I could really go on, but the very simple point is that these crutches don’t work. Cigarettes don’t eliminate stress… they just distract you for a few minutes. The problems return as soon as you put it out (oh, I know… you clever ones will say “that means you just light up another one!”… but there’s really no need to try to reason with you). Your financial difficulties are going to be best addressed when you’re healthy and in a good frame of mind. Try relaxing a bit – naturally. Eat a healthy meal. Find the best, most efficient method of quitting the smoking habit and do it right away. The money you save on cigarettes will add up quickly, no matter how much you spend to quit. 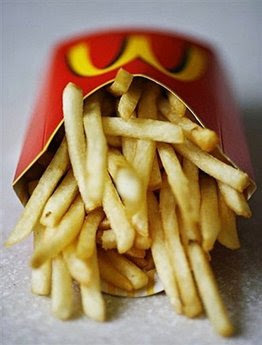 Oh, and go watch the documentary “Super-Size Me”… that’ll cure your McDonald’s addiction very quickly. NextFREE Stop Smoking Event on Jan 4th!